Even sisters worry about money, at least sometimes. Recently I read about Meg Hunter-Kilmer who in her late twenties, after two theology degrees and five years of teaching, left her job, sold everything she had, and now lives out of her car. She trusts God. No. She TRUSTS God. She certainly makes me think again about my own level of trust. But today’s readings are about more than just trusting God. The first reading addresses extortion, injustice, and cheating for the purpose of destroying others. In an environment of purposeful deceit to get ahead at the expense of others’ basic human rights, the word of the Lord evaporates. There is a famine for hearing the word of the Lord which is nowhere to be found. This reading ties together honest care for others, a reverencing of their life and human needs, with the security of God’s leadership and presence in our midst. As we look around us today, as we witness the degradation of the immigrant, the tearing apart of the family, the financial schemes that pit rich against poor, we need to make sure that we aren’t unwittingly swept up in the worry about money at the expense of worrying about our neighbor. In the Gospel, the religious people considered people like Matthew, a tax collector sitting in his customs post, as a sinner. Jesus saw him and asked him to “follow him.” And. Matthew. Did. He left his money and followed a call that spoke to all the longings of his heart. He even spent his money on Jesus, throwing him a dinner that night in his house and inviting his friends. Both Matthew and his tax collecting friends as well as the religious leaders of the day were in need of the divine Physician, the One who healed with mercy, the One who lived facing the broken “other” with an open and inviting heart. Jesus’ heart was unencumbered by the riches of financial or righteous wealth, so he could move freely among everyone else who carried the burdens of moral illness. So when Jesus says we’ll be happy when we live as free as the flowers that luxuriantly populate our fields, here today and gone tomorrow, he tells us that we need to follow him the Word of God, and live as he, facing our neighbor, spending our lives in their service and for their good, trusting all our own needs to him. Kathryn James Hermes, FSP, an author and spiritual mentor, offers personalized and professional guidance for the contemporary Christian’s journey towards spiritual growth and inner healing. 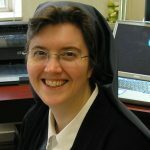 She draws from the spiritual tradition and her own lived experience to lead seekers deep within themselves and through their personal history to deepen their intimacy with and trust in God; live with greater joy, peace, and interior freedom; and encounter the Lord in their past and present life experiences to find healing, grace, and newness of life. She is the director of My Sisters, where people can find spiritual accompaniment from the Daughters of St. Paul on their journey. Sr. Kathryn’s forthcoming book Reclaim Regret: How God Heals Life’s Disappointments will be released in September 2018.